Vasundhara Raje, 65, is the sister of Jyotiraditya Scindia's father Madhavrao Scindia, who died in a plane crash in 2001. Vasundhara Raje was in head-to-toe saffron while the nephew was in a white kurta. At the Rajasthan oath ceremony today, outgoing chief minister Vasundhara Raje of the BJP was seen warmly greeting her nephew Jyotiraditya Scindia, a top Congress leader, setting aside their vast political divide. Vasundhara Raje, 65, is the sister of Jyotiraditya Scindia's father Madhavrao Scindia, who died in a plane crash in 2001. She was seen in a widely-circulated photo wrapping Jyotiraditya Scindia into a hug on the stage at the Albert Hall in Jaipur, her eyes closed with affection. The aunt was in head-to-toe saffron while the nephew was in a white kurta and navy blue jacket. She also tweeted her wishes to the new chief minister, Ashok Gehlot, and his deputy Sachin Pilot. Political affiliations have split the Scindias, a royal family from Gwalior in Madhya Pradesh, right down the middle. 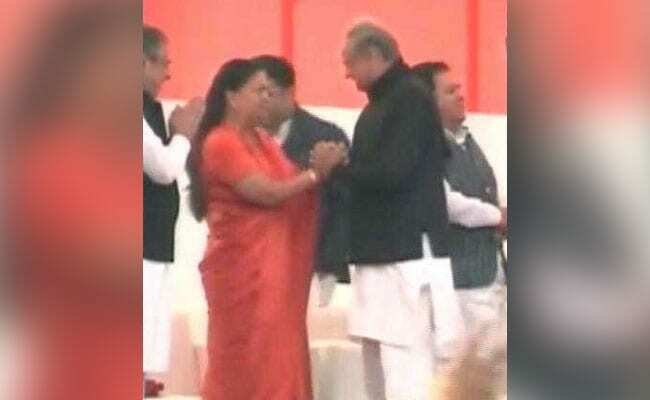 Vasundhara Raje also greeted new Chief Minister Ashok Gehlot. The family matriarch and the mother of Vasundhara Raje, Vijayaraje Scindia, was a founder leader of the ruling BJP. Vasundhara Raje's son Dushyant is also a BJP lawmaker. Madhavrao Scindia, a former minister, was a senior Congress leader. His son Jyotiraditya is also considered to be among the key advisers of Congress chief Rahul Gandhi. Mr Scindia, 47, however, lost out in the intense bid for the chief minister's post in Madhya Pradesh and agreed to step aside for Kamal Nath, a 72-year-old veteran. In 2003 and 2013, when Vasundhara Raje took oath as chief minister, the ceremony was held at Janpath outside the Rajasthan assembly building. Vasundhara Raje lost power last week in "revolving door" Rajasthan after the Congress became the largest party, touching majority along with ally Ajit Singh. Not just Vasundhara Raje, her counterpart in Madhya Pradesh, Shivraj Singh Chouhan, also attended his successor Kamal Nath's oath ceremony in Bhopal.